As you may well expect, we’ve had a vigorous response so far from grantees inquiring about submitting requests for the Recovery Act administrative supplements funding opportunity. We think we’ve set up a pretty good system to expeditiously process requests—once they are complete. 2. We have our own NIGMS-specific requirements. 2. The money stuff—other current and pending support, including Recovery Act requests; current status of funds and expenditure plans. We also need a brief (25-word) summary of the proposed activity that indicates its public health relevance, as appropriate. HHS intends to post this text on its Recovery Act Web site. Some examples are in our guidance document. I get many questions about whether there is a deadline for administrative supplement requests. We need your submissions by July 15, 2009 for FY2009 funding consideration. Please don’t wait until the last minute to send us your materials. Getting them in early is in everyone’s interest. I’m pleased to announce that the NIGMS Web site has a new look, making it easier for you to navigate. 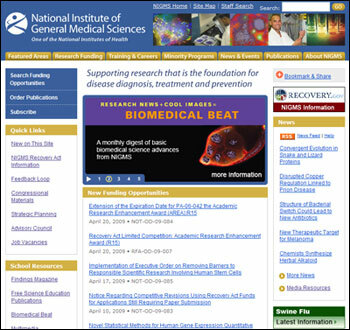 New features include a large, center area with rotating “slides” and prominent links to our most popular pages, including the NIGMS Recovery Act site. You can quickly find the latest funding opportunities or search for them. Also, “bookmark and share” links let you easily share our Web material with others. The new layout retains the site’s current tabbed navigation, but we plan to change this when we overhaul the site later this year. I welcome your feedback on the new design and your ideas for the complete revamp. You can send your comments to webmaster@nigms.nih.gov.